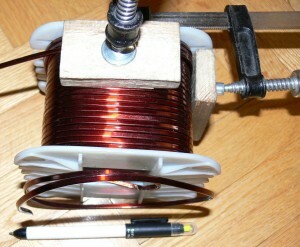 As mentioned earlier, time allowing, I am gradually proceeding with the process of winding the air core woofer coil. 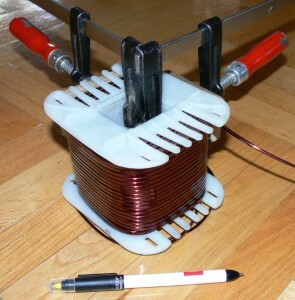 The objective is to achieve 5,2 mH inductance, at 0,09 ohms of resistance, and all this without using any core whatsoever. 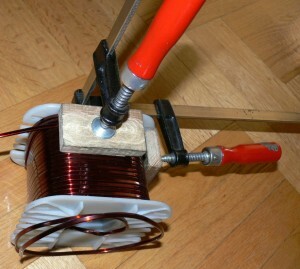 Although being wound on a transformer bobin, this shall indeed be an air coil. The process of creating this coil is a very time consuming and mundane process, as it requires the use of the carpenters clutches, that secure each and every QUARTER turn that is accomplished. I use a pair of such clutches, so that whilst creating a new quarter turn, I “unclutch” the one that is further off, whereby the closer one stays intact. This way, I have full control with regards to the tightness of the winding. And indeed, believe me (and if not me – than at least the blisters on my hands) it IS tight. Winding a coil with a 2 mm x 3,5 mm = 7 mm2 copper profile turns out to be no trivial feat, but luckily with the clutches it is still within the possible. As can be seen above, the coil has already exceeded a weight of 4 kilograms. 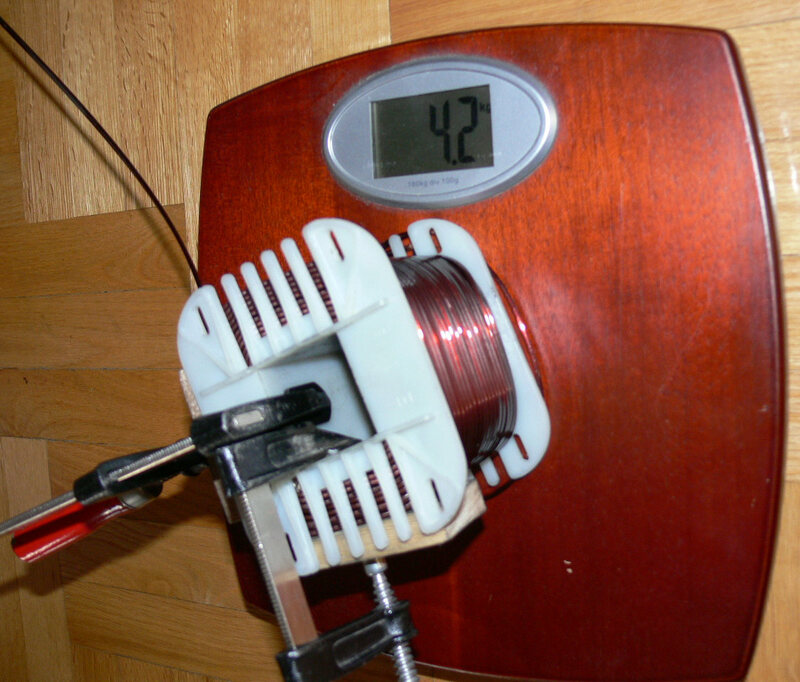 The inductance achieved thus far is 2,3 mH, so things are looking good. 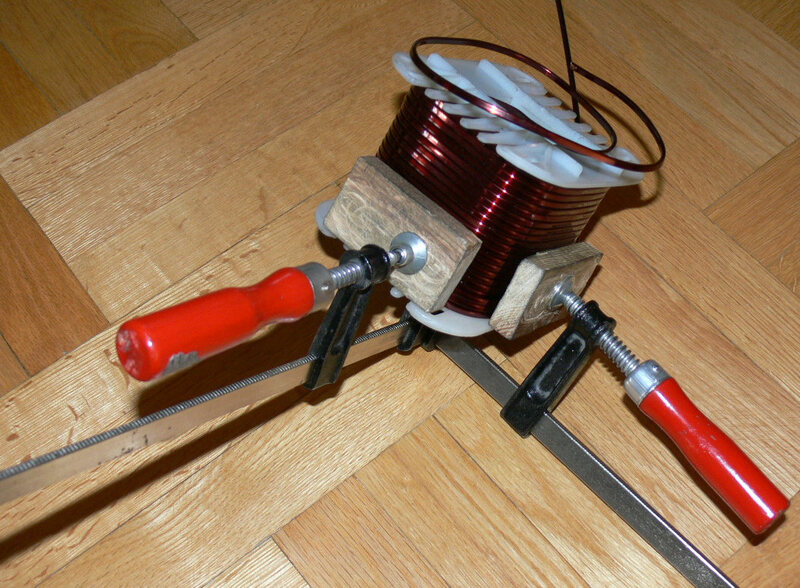 Each doubling of the number of turns essentially quadruples the inductance, so I am not that far off to go. Over 67% of the winding is complete by now. The bobin turns out to be a tad too small, but we will manage. 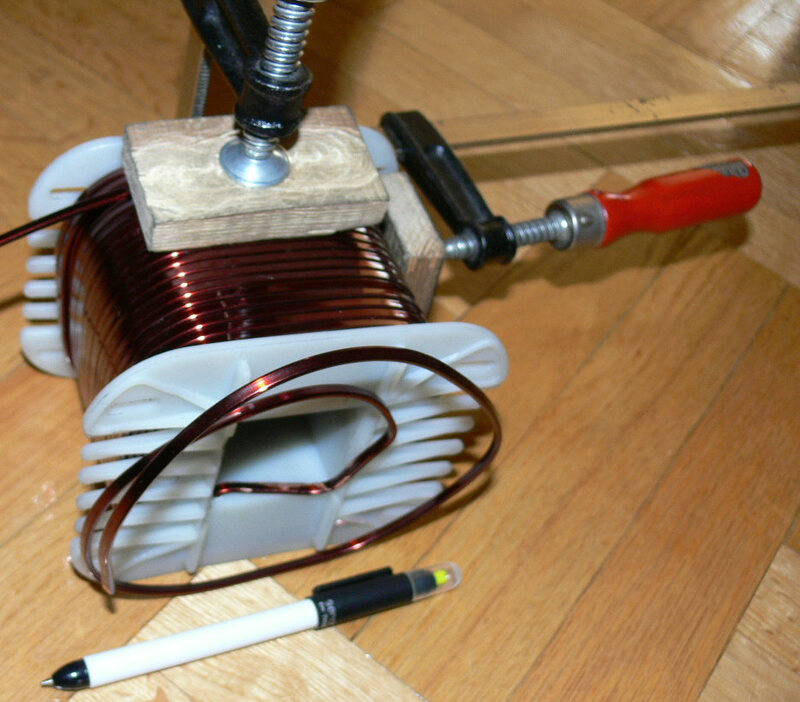 The pieces of wood are used so as to isolate and protect the insulation varnish of the copper profile from the metal jaw of the carpenters clutch. This way, I am sure that there shall be no internal short circuit within the coil, when it is ready. 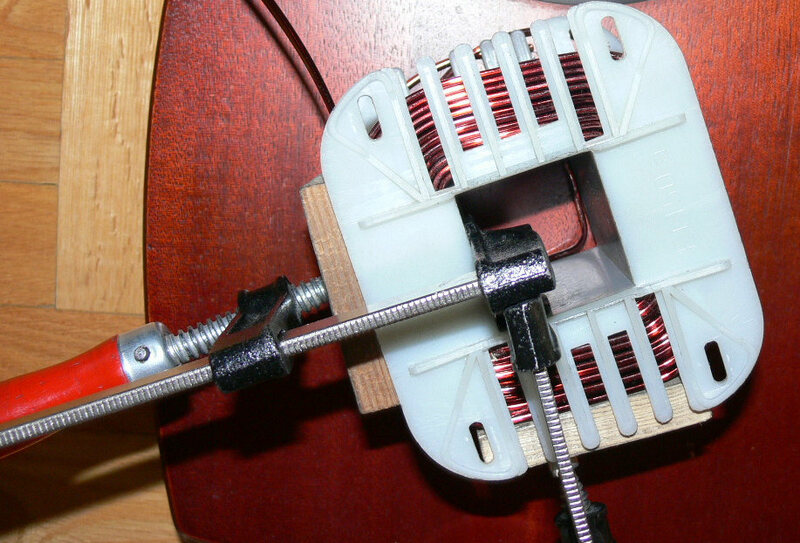 After each and every new quarter turn, I leave the clutches in place, tightly squeezed, so that the winding maintains a very dense and tight profile. The only thing that was a bit way off in this project was the estimation of the required length of copper profile. 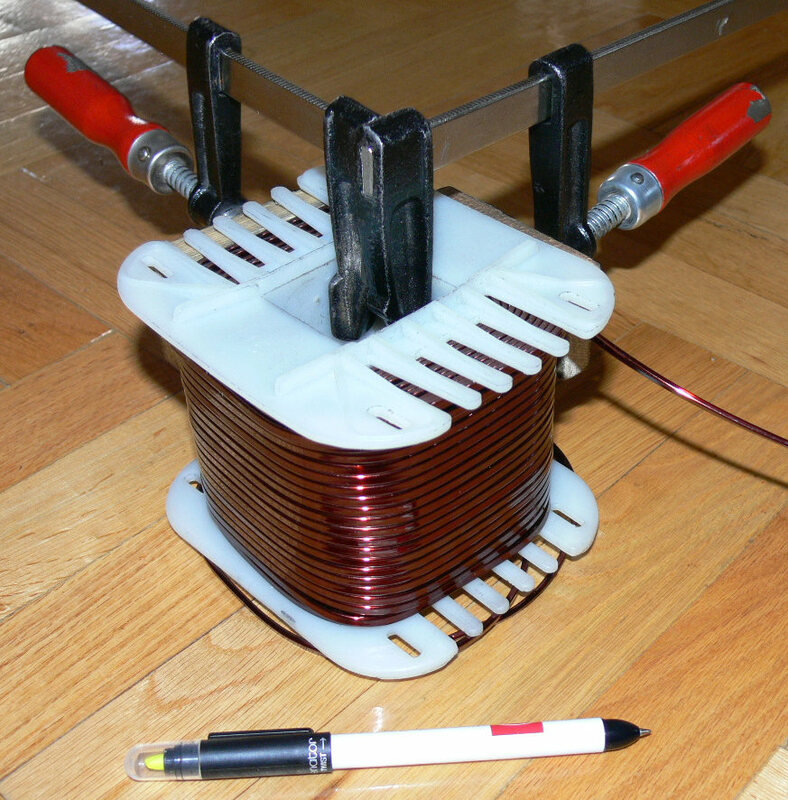 Initially, I purchased 6 kilograms of copper and this amount was supposed to be sufficient for the creation of a pair of coils, 3 kg each. Slightly miscalculated on that one. 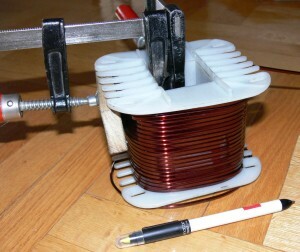 It turns out that the whole six kg of copper will be used up for the creation of a single coil. And hopefully it will turn out to be enough. Ouch ! I am not even considering the option that it would not be enough). Well, … nobody is perfect.